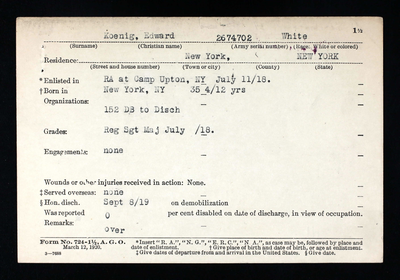 United States Army 1st Lieutenant Edward Koenig (service #2-674-702) was born on February 19th 1883 in New York, New York. Edward was living at home with his parents & working as a clerk before he began his military career. 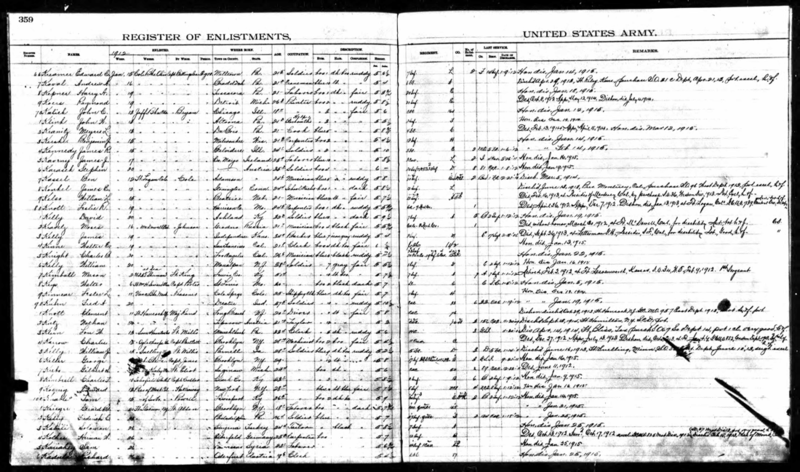 Edward Koenig enlisted on Sept. 11th 1903 as a Private at Fort Columbus, New York. He was assigned to Company G, 8th US Infantry. Koenig was recommended for the Certificate of Merit in 1905 for an action on July 13th 1905 at Governors Island Dock, New York, New York. “For saving from drowning, at the risk of his own life, a civilian who jumped into the bay with the intention of committing suicide.” Koenig was transferred to the 12th US Infantry on Dec. 10th 1905 per Special Order 703 of the Eastern Department in 1905. 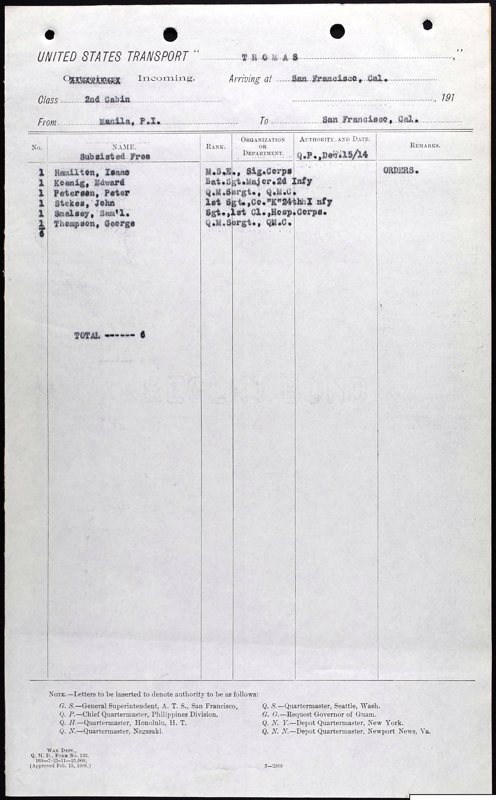 This is likely because the 8th Infantry was ordered to the Philippines and Koenig was due his discharge in a month, so he was transferred to the 12th to finish out his enlistment. Koenig was most likely motivated to spend the holiday with his family. 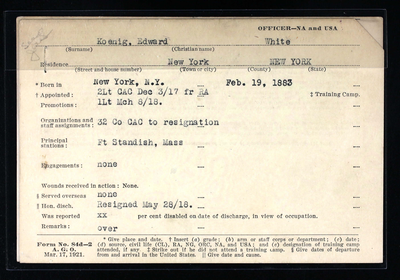 Koenig was discharged on Jan. 11th 1906 at Fort Jay, New York per War Department General Order 87, 1905 as a Private. Private Koenig immediately reenlisted on Jan. 12th 1906 at Fort Jay, New York and was assigned to Company E, 8th US Infantry. Koenig was awarded the Certificate of Merit Medal No. 97 per War Department General Order 143 in 1907, during this enlistment. 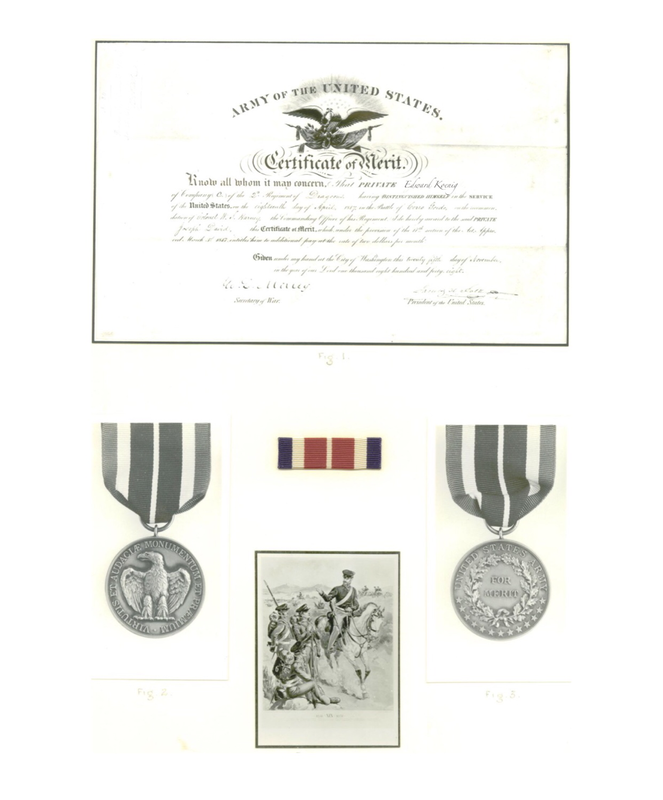 Koenig served a tour in the Philippines, qualifying him for the Philippine Campaign Medal for service in 1907-1908. 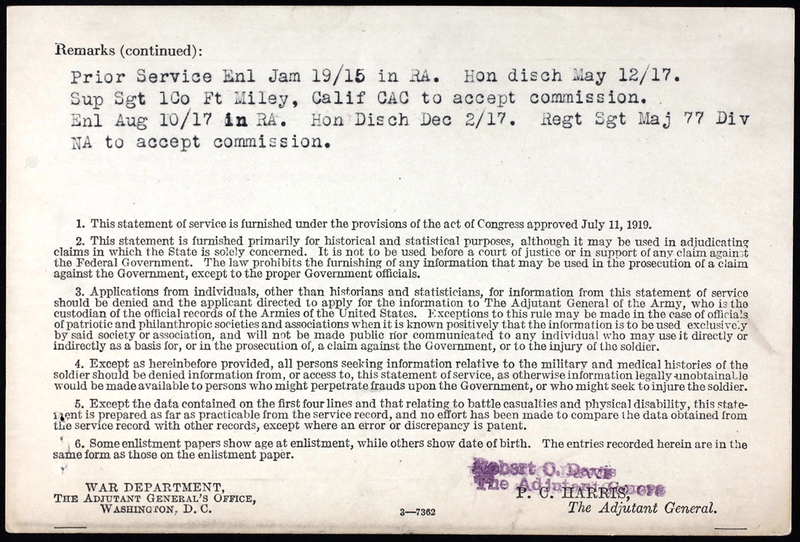 Sergeant Koenig was discharged Jan. 11th 1909 at the Presidio in Monterey, California as a Sergeant. Koenig immediately again re-enlisted on Jan. 12th 1906 at the Presidio in Monterey, CA. He remained in Company E, 8th US Infantry until he was promoted and joined the Non-commissioned Staff of the 8th US Infantry. 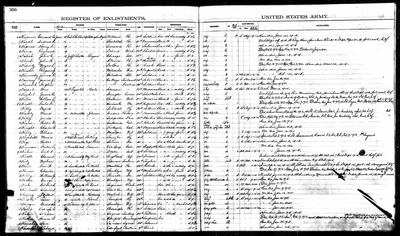 According to the 1910 US Census Koenig was stationed at the Presidio in Monterey, CA as of May 1910. Koenig was discharged on January 12, 1912 at the Presidio in Monterey, California as a Battalion Sergeant Major. The Sergeant Major immediately reenlisted on Jan. 13th 1912 at the Presidio in Monterey, California. 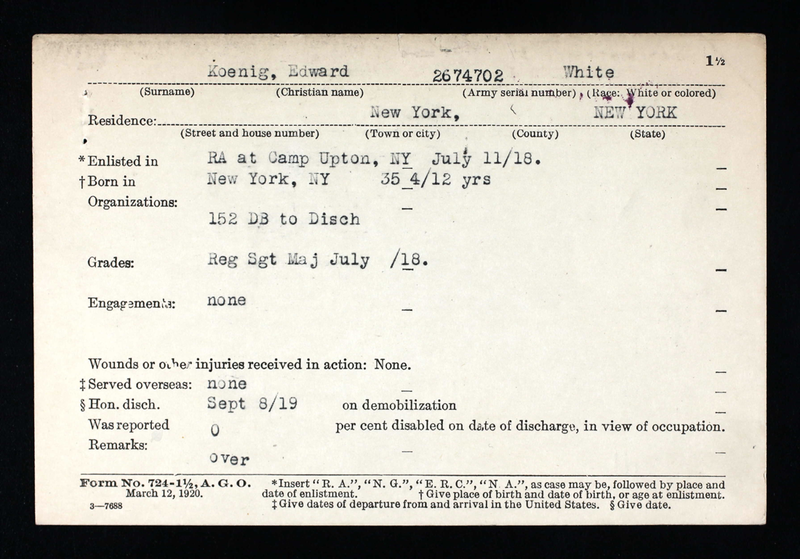 He remained on the Noncommissioned Staff of the 8th US Infantry, & was discharged on Jan. 16th 1915. Sergeant Major Koenig re-enlisted on Jan. 19th 1915 & he was assigned to Co. 13, Coast Artillery Corps. Koenig was discharged May 12th 1917 while serving as the Supply Sergeant of the 1st Company, Coast Artillery Corps at Fort Miley, CA. 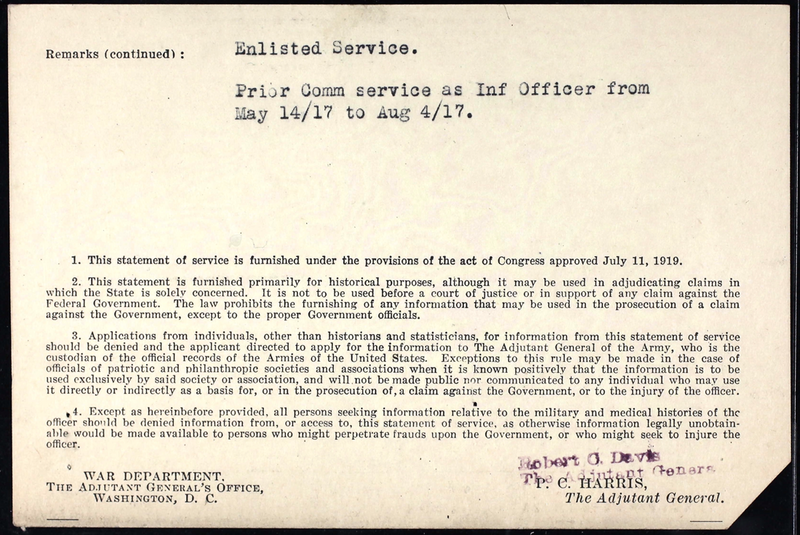 Koenig accepted a commission as a First Lieutenant in the Officers Reserve Corps on May 2, 1917. Koenig reported to active duty as a First Lieutenant of Infantry on May 14th 1917 & he remained on active duty until August 4th 1917. Koenig re-enlisted in the Regular Army on Aug. 10th 1917 & he was assigned to Company 5, Coast Artillery Corps. 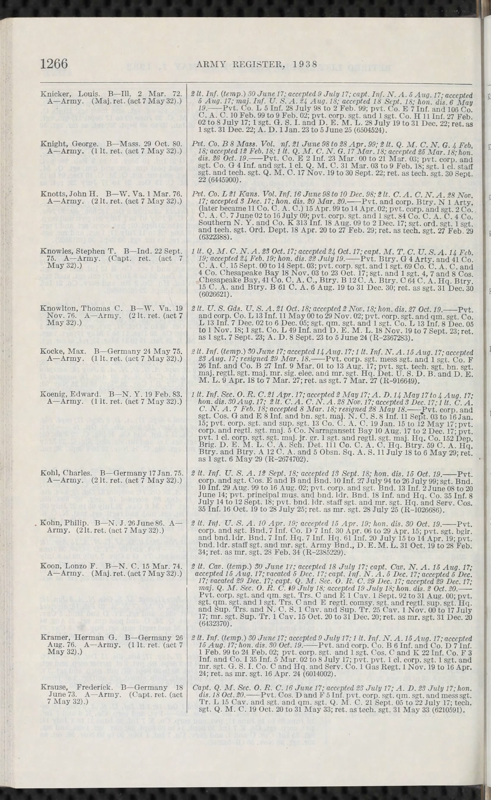 Koenig was discharged from the Officers Reserve Corps on August 30th 1917. Koenig served as the Regimental Sergeant Major of the 77th Division until his discharge. Koenig was discharged from the Regular Army on December 2nd 1917 as the Regimental Sergeant Major to accept a commission in the National Army. 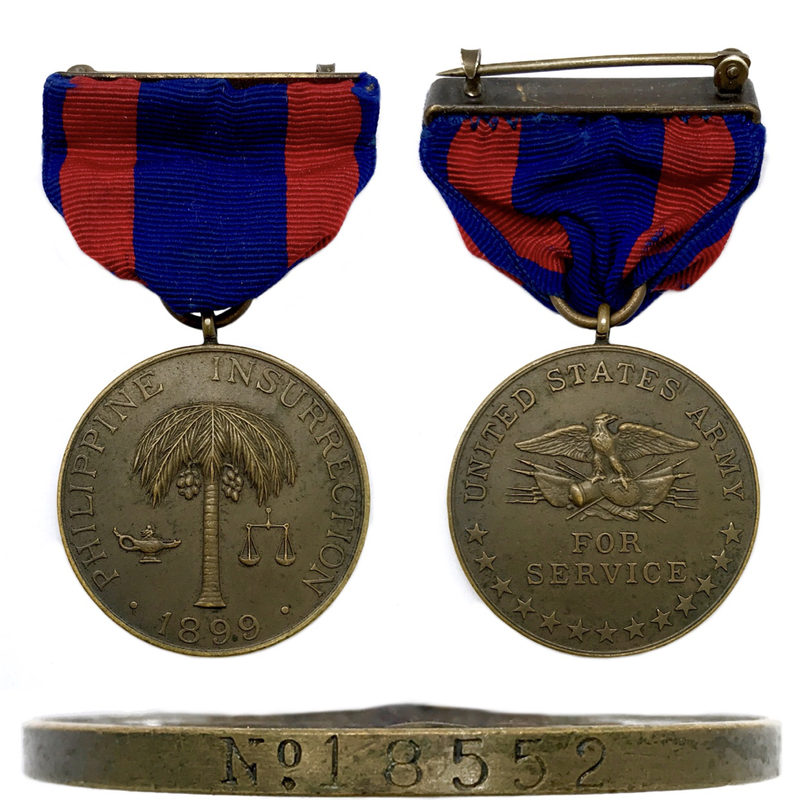 Koenig was commissioned as a 2nd Lieutenant in the Coast Artillery Corps, National Army on Nov. 28th 1917. Lt. Koenig accepted the commission on Dec. 3rd 1917. He served in Company 32, Coast Artillery Corps; which was stationed at Fort Standish, Massachusetts. 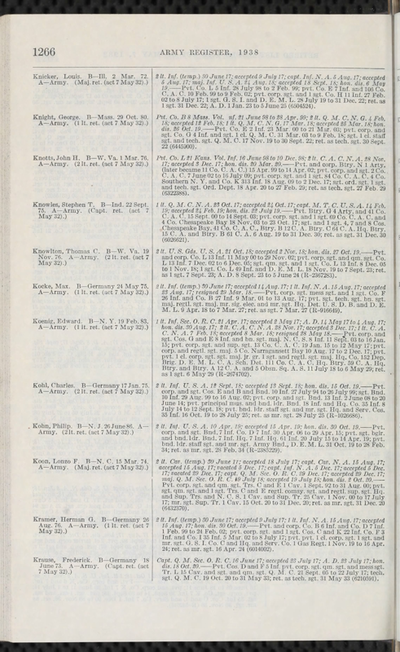 Lt. Koenig was promoted to 1st Lieutenant in the Coast Artillery Corps of the National Army; which he accepted on March 8, 1918. Koenig resigned his commission on May 28th 1918. It appears the Koenig resigned in an attempt to go overseas during World War I.
Koenig re-enlisted in the Army on July 11th 1918 at Camp Upton, New York. He was assigned to Headquarters Company, 152nd Depot Brigade. He was promoted to Regimental Sergeant Major in July 1918 & he was discharged on Sept. 8th 1919. 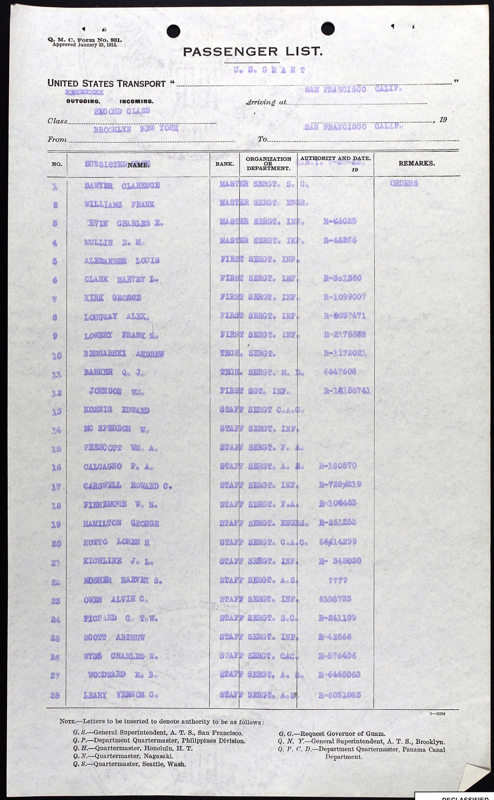 After World War I the Sergeant served in the Detachment Enlisted Men List, then the Coast Artillery School Detachment, then Company 111, Coast Artillery Corps, then Headquarters Battery, 59th Coast Artillery Corps Regiment which was stationed in the Philippines. He later served in Headquarters Battery & Battery A of the 12th Coast Artillery & later in the 5th Observation Squadron. Koenig retired from the Army on May 6th 1929 as a First Sergeant. According to the 1940 US Census Koenig was living in Newark, New Jersey. The census states that he lived in the Bronx, New York in 1935. It appear that Sergeant Koenig died on March 20th 1948 in Manhattan, New York.